Several users have kept asking us for an alternative way to pay than credit card payment. Today it’s live, you can pay your containers and addons with pre-paid credit bought with PayPal. Since the beginning of our commercial offer in Frebruary 2015 we have only been accepting credit card payments through Stripe as payment gateway. Some users have been complaining about that, wishing to use less credit card dependant payment methods. That’s why we’ve decided to add Paypal as payment solution. People and companies often have a PayPal account, they know how it works and in most of the case, they trust this company to keep their banking data safe. 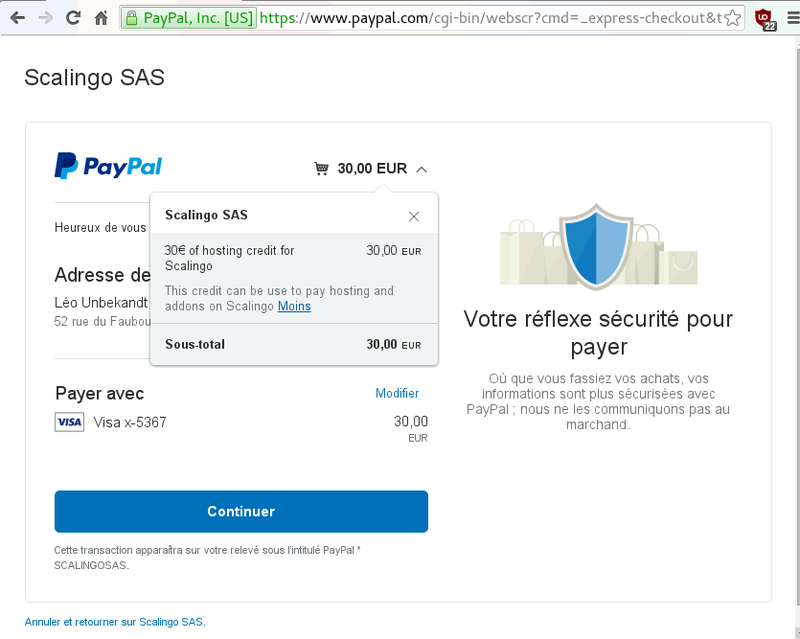 PayPal let you use directly your bank account as payment source, thus you are now able to pay on Scalingo without the use of a credit card, by using your PayPal account directly. PayPal payment is not similar to credit card payment because you have to buy credit for your account which will be used in priority to pay your invoices. It means that if you have both a credit card and pre-paid credit, we’ll use the credit until there is no more, and pay the rest with the configured card. If you are only using paypal credit and that there is not enough credit to pay your monthly invoice, you’ll be notified and will have 3 days to add enough credit to your account to pay the pending invoice. PayPal has a way to achieve monthly automatic payments of variable amount of money, in our case the price of the platform usage each month. However this feature is reserved to companies using PayPal for a long time. The other method to have monthly automatic payment is to handle it with a monthly fixed amount. This last solution does not really fit our needs as the amount may change from one month to another. In one case you would over-provision your account or in the other case you may under-provision it. As a result, we’ve decided to apply the following model: automatic payment by card and pre-paid credit with PayPal. If one day we’ve the opportunity to enable the feature ‘Reference Transactions’ with PayPal, allowing us to smoother experience for our customers, of course we’ll do it. To buy some PayPal credit, you have first to go to your “Billing Profile” and click on the PayPal tab. 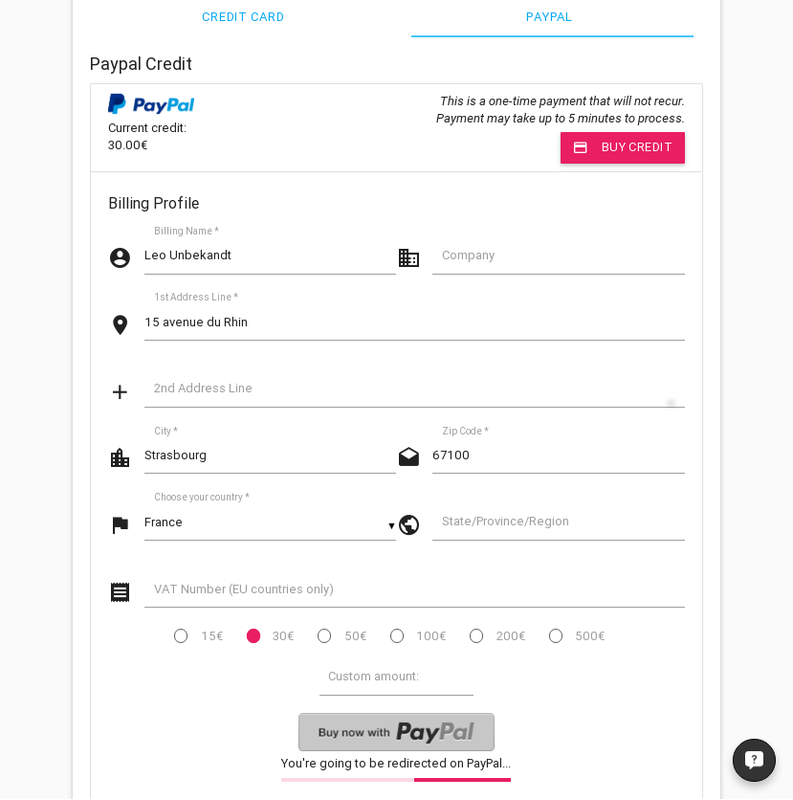 Then choose ‘Add Credit’, fill your billing profile, choose the amount your want to credit your account (minimum is 10€), and finally, click on the PayPal checkout button. A few seconds later, you’re redirected to PayPal confirmation gateway to approve the transation, once it is done, you’re redirected to Scalingo’s dashbaord, the system will check the transaction, and that’s it, the credit has been added to your account. There are now two different ways to handle payment on the platform. If you’re interested in any other method, don’t hesitate to reach us at hello [at] scalingo [dot] com. We’d be glad to discuss it with you.